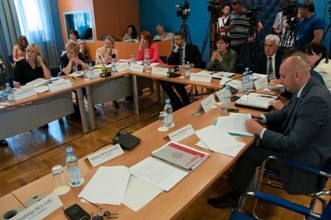 Upon the invitation, Union of Municipalities of Montenegro participated in a joint session of the Committee for European Integration and the Committee for Economy, Finance and Budget of the Parliament of Montenegro held on 11 May 2015, regarding the dialogue (consultative hearing) on the topic “Efficiency of using IPA funds and the Audit authority work responsible for the audit of EU funds”. On the behalf of the Union of Municipalities of Montenegro the meeting was attended by Secretary General Mr. Refik Bojadzic and Mr.Sasa Scekic, acting Assistant Secretary-General and Mr. Darko Mrvaljevic, Coordinator of the Network of Municipal Project Managers. In addition to the two committees’ members, the session was attended by: Mr. Aleksandar Andrija Pejovic, Chief Negotiator for EU negotiations and National Coordinator for IPA to Montenegro, Ms. Marija Radenovic, Director General for Finance and Contracting the EU assistance in the Ministry of Finance and Ms. Mila Barjaktarovic Chief Auditor of the Audit body. During the three-hour debate the session’ participants expressed different opinions and views on principles to contracting, as well as the implementation of projects under the IPA. They also discussed the lack of fiscal capacity of local government, as well as the challenges that are reflected in the pre-financing and co-financing, and on the system of responsibility in case of inefficient use of resources. In addition, the percentage utilization of IPA funds that were allocated to Montenegro in the period from 2007 to 2013 was pointed out, and the indicative breakdown that expecting us in the future was discussed. Since local governments are an important factor in the Montenegro accession to the European Union, having in mind that they are expected to provide a strong contribution to the European integration of our country, representatives of the Union of Municipalities pointed out that it is necessary to utilize all the benefits provided by the EU through the possibilities for using EU funds. In order to properly benefit from the opportunities provided by EU funds, professional and administrative capacities development at the local level in the planning, preparation, application and management of projects financed from EU funds are really necessary. In this regard, the Secretary-General Mr.Refik Bojadzic emphasized the importance of the functioning of the Network of Municipal Project Managers. Having in mind that most of the local government units in Montenegro are in a very difficult financial situation, Mr. Refik Bojadzic especially pointed out the insufficient capacities of municipalities to provide pre-financing, which is a pre condition for use of EU funds. In this regard, he stressed the need to establish an appropriate mechanism to enable local government units to provide pre-financing and co-financing of EU projects and, thus, more efficient use of available EU funds. Chairman of the session, the Chairman of the Committee for European Integration Mr.Slaven Radunovic and Chairman of the Committee for Economy, Finance and Budget Mr. Aleksandar Damjanovic, pointed the importance of launched debate, especially in terms of more efficient use of EU funds and to overcome the difficult financial situation of local governments.